Michael Cohen, U.S. President Donald Trump's former personal lawyer, says he is providing "critical information" as part of special counsel Robert Mueller's investigation. Michael Cohen, U.S. President Donald Trump's former personal lawyer, said Thursday he is providing "critical information" as part of special counsel Robert Mueller's investigation into Russian interference in the 2016 U.S. election and possible co-ordination between Russia and the Trump campaign. 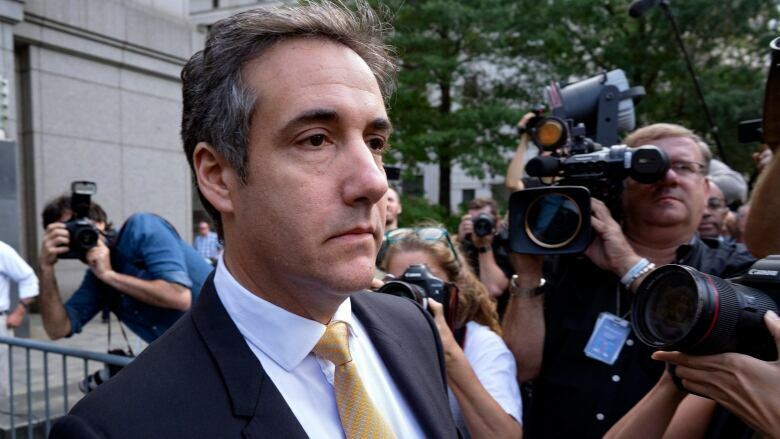 Cohen, who pleaded guilty to campaign finance and other charges last month, said he is providing the information to prosecutors without a co-operation agreement. Trump's longtime fixer-turned-foe could be a vital witness for prosecutors as they investigate whether Trump's campaign co-ordinated with Russians. For more than a decade, Cohen was Trump's personal lawyer, and he was a key power player in the Trump Organization and a fixture in Trump's political life. On Thursday night, Cohen tweeted: "Good for @MichaelCohen212 for providing critical information to the #MuellerInvestigation without a cooperation agreement. No one should question his integrity, veracity or loyalty to his family and country over @POTUS @realDonaldTrump." The tweet was deleted almost immediately and was later reposted by his attorney, Lanny Davis, who said he wrote the tweet for Cohen and asked him to tweet it because he has a "much larger following." Davis said he was delayed posting the tweet on his own account, so Cohen tweeted it first. FYI - I wrote a Tweet congratulating <a href="https://twitter.com/MichaelCohen212?ref_src=twsrc%5Etfw">@MichaelCohen212</a> and sent text to him to Tweet to his much larger following - but was delayed posting myself so he posted first. All take a breath. I don’t control or have access to Mr. Cohen’s Twitter account. He is my client and my friend. Davis had asserted last month that his client could tell the special counsel that Trump had prior knowledge of a June 2016 meeting at Trump Tower with a Russian lawyer, Trump's son-in-law and Trump's eldest son, who had been told in emails that it was part of a Russian government effort to help his father's campaign. But Davis later walked back the assertions, saying he could not independently confirm the claims that Cohen witnessed Trump's eldest son, Donald Trump Jr., telling his father about the Trump Tower meeting beforehand. In the last two weeks, the special counsel secured the cooperation of Trump's former campaign chairman, Paul Manafort, signalled that he has obtained all the information he needs from former national security adviser Michael Flynn — who was also a government cooperator and dispensed with the case of the campaign aide who triggered the Russia probe. The president has continued a very public battle against the Mueller investigation, repeatedly calling it a politically motivated and "rigged witch hunt." He has said he is going to declassify secret documents in the Russia investigation, an extraordinary move that he says will show that the investigation was tainted from the start by bias in the Justice Department and FBI.